Expression of Affinity. A Like is an expression of casual affinity. It indicates the visitor has an interest in your business and wants to hear from you. It’s similar to someone opting-in to receive email updates. This can lead to the building of more personal relationships with customers and a greater degree of engagement with them, as well. More Engaged Users. According to Facebook, people who click the Facebook Like button are “more engaged, active and connected than the average Facebook user.” Facebook claims the average “Liker” has 2.4 times the amount of friends than that of a typical user and he or she is also more interested in exploring content they discover on Facebook. Likers click on 5.3x more links to external sites than the typical user, says Facebook. Email Marketing Capability. Once people Like your page, they are added to your fan base. Using the messaging feature contained in the page’s administrative console, you can send broadcast-style emails to all your fans, or target them based on demographics, such as age, gender and location. While this tactic should not be overused, sending an occasional email is another way to stay top of mind with customers. 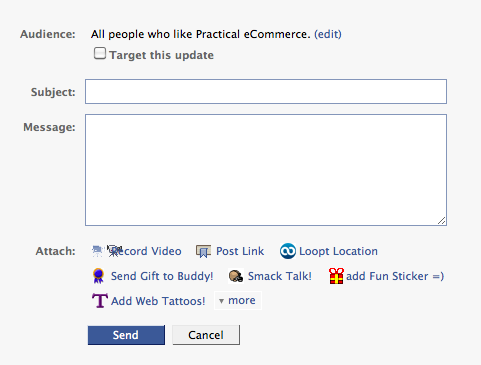 Send emails using the Facebook Page message component. A news feed item appears each time content is Liked. Facebook reports that the average user has 130 friends who can also Like the item once it’s published. That means, depending on the number of fans you have multiplied by the number of friends they have, your content could achieve wide viral syndication. That can lead to increased traffic to your Page as a result. If the posted content originated from your website, that could mean more traffic comes to your site, too. More Traffic to Website. Speaking of more traffic, incorporating the Like button to your website can serve you well in terms of increasing traffic. Each time visitors click the button, information about your site is shared with their friends via the News Feed, which can result in more traffic. Also, Like buttons are among the easiest to use of all the Facebook social plug-ins, requiring only a small piece of code to be embedded on a web page or website. Even those merchants lacking technical skills can incorporate it. Becomes Part of Facebook Graph. In his post titled “How Facebook Will Kill Online Display Advertising,” blogger Eric Schwartzman suggests that Liking an object means it “becomes a node on the Facebook graph, so it appears in search.” If it is a product, brand or service, it also appears on the Facebook profile page of the user, says Schwartzman. That also includes Facebook Pages Liked by the person. More Effective Advertising. Facebook’s advertising platform keeps a record of all Like activity. Merchants who use this platform can access this data to produce more highly-targeted ads. This means merchants can achieve a greater degree of relevance with their advertising. Likes Lead to Insights. 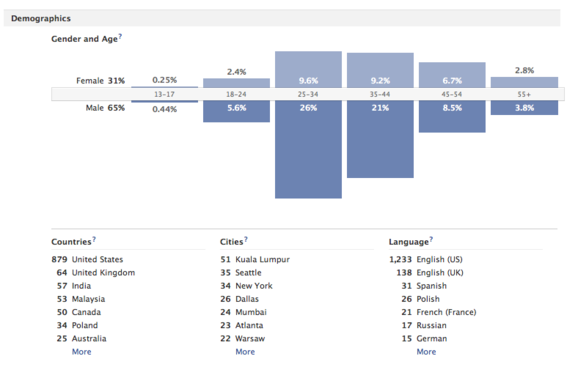 Associated with every Facebook Page is an analytics component called Insights. It provides detailed data on fan activity on the page, as well as demographic information such as age, gender and geographic location, all of which can be important for the purposes of market research. Facebook Insights can provide valuable market research. On average, Fans spend an extra $71.84 they would not otherwise spend on products they describe themselves as Fans of. Fans are 28 percent more likely than non-Fans to continue using a specific brand. Fans are 41 percent more likely than non-Fans to recommend a product. Eventbrite, the event marketing company, published research findings that indicated Facebook was its top referral site for traffic, surpassing even Google. And each time a customer shared a purchase with friends on Facebook, it translated to 11 visits back to Eventbrite.com. This equated to $2.52 per share in ticket sales, according to the report. A survey of Practical Ecommerce readers held in January 2011 revealed that a vast majority — 77.1 percent — received less than five percent of sales from social media. Another 13 percent estimated between 5 to 10 percent of their sales came from social media. With respect to social media’s effect on ecommerce sales, past activity should not be the sole indicator of future performance. Social media is here to stay and Facebook is the leading social network site. Therefore, it’s worthwhile to leverage the site, even if that is only five percent of sales. The marketing benefits listed above suggest Facebook has the potential to be a viral marketing engine, and the Like button is the accelerator.